Kyle, 24, is a member of Toms River Yacht Club and has crewed sporadically in E-Scows on Barnegat Bay over the past few years. He is far better known for his long list of accomplishments as a singlehanded sailor, first in the Optimist Dinghy and then in the Laser Radial and Laser. Kyle was named to his first U.S. National team in the Optimist when he was 11 and competed in his first World Championship, in Qingdao, China, when he was 12. He won the 2001 U.S. Optimist national championship, at 13, and topped the Optimist class at the prestigious CORK regatta in Canada in both 2001 and 2002. 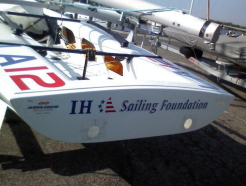 Kyle was the top American at the 2002 Optimist World Championships, placing 28th, and also won the 2003 Balboa Cup National Pram Championship, sailed in Hawaii in El Toros. Across his Optimist career, he competed on two World teams, two South American Championship teams and one European championship team. In 2003, Kyle began racing Lasers, winning the Laser 4.7 North American Championship in Ontario, Canada and placing 7th at CORK in the Laser Radial; he also finished 7th in the Cressy Cup, the U.S. high school singlehanded championship. As he grew, Kyle’s Laser Radial results continued to improve through 2004 as he won the Radial class at the Gulf Coast Championship, Great Lakes Championship and CORK, and placed 2nd at the Cressy Cup, 5th at the U.S. Nationals and 6th at the North Americans. In 2005 he jumped to another level in the Radial, winning the U.S Youth Championship, Atlantic Coast Championship and Canadian Nationals and placing 2nd at the North Americans and CORK, 3rd at the Cressy Cup, and 8th at the Worlds in Brazil. In 2006, Kyle stepped up to the full-rig Laser, placing 6th at the U.S. Youth Championship and CORK and 2nd at the Atlantic Coasts. He then jumped back into the Radial for the Youth Worlds in Los Angeles that summer and took the title in a 70-boat fleet. Kyle also began college sailing at Old Dominion University in Norfolk, Va. that fall, winning C division at the 2006 Nevins Trophy at Kings Point. In 2007, Kyle won his first of two U.S. Singlehanded Championships, also known as the O’Day Trophy (his second came in 2009), and placed 3rd at the Laser North Americans and 2nd at the U.S. Nationals. He also finished 13th at the U.S. Laser Olympic Trials and took 6th in U.S. Sailing’s Championship of Champions, sailed in Snipes in Mission Bay, Calif. In 2008, he won the Laser Atlantic Coast Championships and placed 6th at both the Miami OCR and US Laser Nationals. Kyle continued to compete in both Lasers and doublehanded dinghies on the collegiate circuit, placing 2nd at the 2008 ICSA Singlehanded Nationals at Cornell and 3rd in A Division at the 2009 ICSA Dinghy Nationals in San Francisco. Kyle then took a break from school to campaign in the Laser for the 2012 London Olympics and spent the next two years competing internationally, with top finishes of 3rd at the 2010 Miami OCR, 4th at the 2011 North Americans and 4th in the 2012 U.S. Laser Olympic Trials. After finishing his Olympic effort, Kyle returned to ODU and graduated in 2012 with a B.S. in Mechanical Engineering. He began his professional career working for Harken Inc. in Pewaukee, Wisc. as a custom engineer, focusing on super-yacht projects, and in May 2013 took a similar position with Viking Yachts in New Gretna, N.J. He will be sailing the E-Scow out of Toms River this summer with his fiancé Alissa Ayres, a former star collegiate crew at ODU, and veteran E-Scow sailors Ian Sutherland and Ben Condon.